Aranmula Kannadi – What are the different types available? Aranmula kannadis are basically categorized in to three different types. under each type many number of models are available according to the skill and capabilities of our artisans. Hand Mirrors or Valkannadi’s – Hand mirrors or valkannadis are the traditional aranmula kannadi models, it was the very first model of aranmula kannadi made back in 17th century. Fixed stand mirror – fixed stand mirrors are the ones with a base, and these kind of mirrors are the biggest models among the aranmula mirrors. Aranmula Kannadi – Which size is best to buy? Which size of aranmula kannadi is suitable for you to purchase? Many customers having this confusion, like is there any significance in the size of the aranmula mirror? actually there are no significance in the size of the mirror, other than when its big, it would be visually appealing and attractive. But our suggestion is, if you are buying an aranmula kannadi to gift someone, like a wedding gift, or a gift to any special guest – we always suggest to buy a medium size aranmula mirror ( size from 2.5 inches to 4 inches maximum). The reason is most of the times, the receiver of the gift may wanted to carry it along with him/her while travelling back to his/her home / home country. So gifting bigger and heavy mirrors on such situations made it difficult to carry the precious gift like aranmula kannadi. If you are gifting / buying aranmula kannadi to show it in your house / business / hotel / resort – we always recommend you to buy the bigger ones – like the fixed stand mirrors. fixed stand mirrors are the biggest and heaviest mirrors among aranmula kannadi. since they are big and elegant everyone will look and appreciate it for sure. We are getting lot of requests for supplying aranmula kannadi – both for business and for some big functions. usually calls are coming from various places in India like Pune, Delhi, Mumbai, Bangalore etc… and they ask does we have any shops in their cities? – and some of them even told us, they found some shops selling aranmula kannadi’s. all they wanted to know whether those shops are selling original aranmula kannadi. To answer such questions – Aranmula kannadi is a GI patented article – means it is geographically attached and patented. So Aranmula kannadi can’t be produced anywhere other than Aranmula. also We can’t assure that the aranmula kannadis selling through shops are genuine aranmula kannadis. ( sometimes they may be buying from us and selling there – but untill we see the mirrors we can’t assure that). We are the biggest suppliers of aranmula kannadi both in India and abroad. we provides lifetime warranty and authenticity certificate for the aranmula kannadi with the signature of the artisan who made it for you. Each of our kannadi’s are strictly checked for the clarity and quality and we can say it is the best kind of kannadi you can get in this entire world. 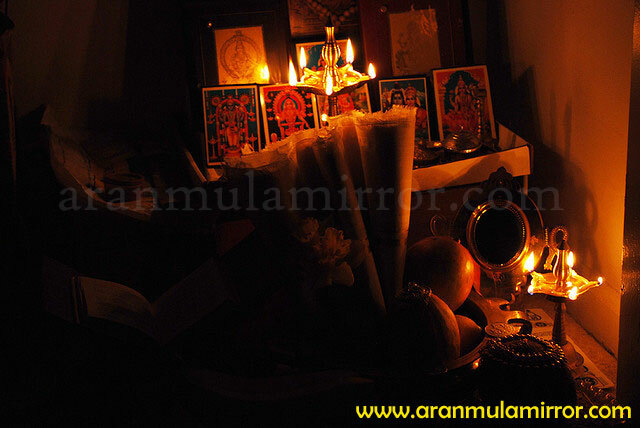 We are getting many mails asking whether it is possible to place aranmula kannadi in pooja room? and if there is any particular measures to be taken – if we put aranmula kannadi in pooja rooms? Yes, You can place aranmula kannadi in your pooja rooms. it will attract positive energy, good luck and property in to your home. and when you put the mirror in your pooja room, make sure that you are facing the mirror to the East direction. Back stand aranmula kannadi and fixed stand aranmula kannadi are the ideal models for putting in pooja rooms. 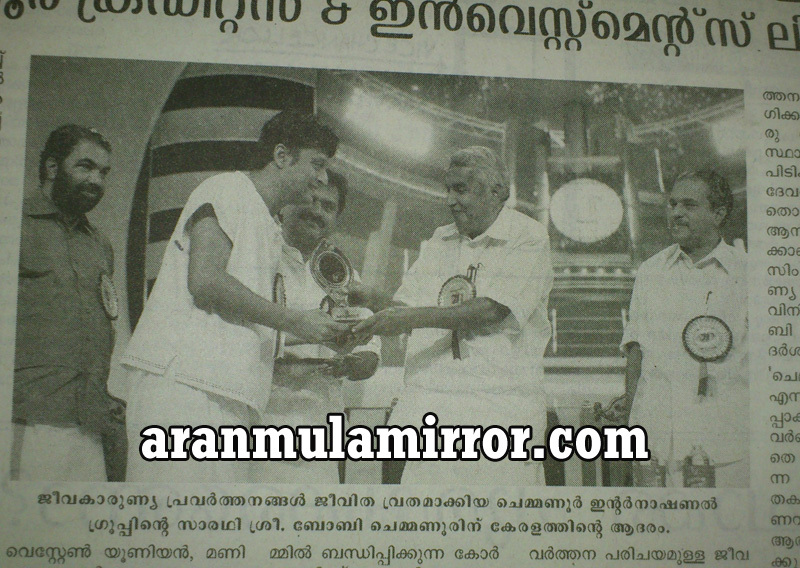 Kerala CM – Sri. oommen chandi gifting Arnamula Kannadi for the contributions of Mr.bobby chemmannur – The MD of Chemmannur International Group for society. Aranmula Kannadi – Adding Prosperity to your family! Aranmula Kannadi is a symbol of luck and prosperity, and it is really great to see many families are keeping aranmula kannadi with them. As you know Aranmula kannadi is one of the eight auspicious items which are considered as a must have for a good family – it will bring peace, good luck and prosperity to our family, and a best procession for a lifetime. You can see various beautiful aranmula kannadis in our online portal – www.aranmulamirror.com. For houses, Back Stand mirrors ( Kannadi’s with a backstand ) is recommended. You can keep aranmula kannadi in your pooja room. or any other places where lots of lights / exposure to the atmosphere ( like showcase in your living room). Hundreds flocked to posses the Aranmula Kannadi, known to be an auspicious object that heralds prosperity. The ongoing exhibition at SMSM Institute, Trivandrum features various models of the Aranmula metal mirror at prices ranging from Rs.2,000 to Rs.70,000. “The in-house exhibition is being organised by the Institute to promote Aranmula mirrors and to increase sales by offering a 10 percentage discount. We started the exhibition on March 8 and we have already sold a good number of pieces by now,” said K J George, Manager SMSM Institute, Trivandrum. As we know, Aranmula Kannadi is protected with GI patent tag ( geographical indication tag ) . This tag protects the Aranmula kannadi in such a way that, It can’t be make in anywhere else than in Aranmula.